This poster depicts two people outside a wall. One person is entering a narrow passage in the shape of a cross labeled “Gate of Grace”. The other person is carrying boxes labeled “Sin”, the person at the passage seems to have dropped his “Sin” boxes. Based on how small the passage is and the way the person is holding his boxes it is clear that he cannot pass through while holding the boxes. The person at the passage is hunched over with his head down and his hands in front of him, which looks similar to how people pray. On the other side of the wall there is a path labeled “Way of Righteousness”. The path leads to a bridge labeled “Bridge of Salvation” that crosses over a river labeled “River of Death”. After the bridge is another wall with a much larger gate that is labeled “Gate to Eternal Life”. These labels coincide with religious teachings of the path of life. The colors used in the poster become brighter the closer to the “Gate to Eternal Life”. Where the two people are standing the ground is muddy and colored with brown, while the other side of the “Gate of Grace” has grass and is colored with green and yellow. The sky on the left side of the poster is darker with more grey and blue, while the sky over the “Gate to Eternal Life” is entirely yellow. At the top and bottom of the poster are bible verses about finding salvation with God. The message of the poster, is very clear and, follows traditional religious teachings, that if you abandon your sins and live a righteous life you will reach eternal life in heaven. The role of some of the minor details in the poster are hard to understand. For example, there are angels around the bridge and above the final gate. The angels may just be used to represent the holiness of the area to emphasize the connection to heaven, but I cannot think of a deeper meaning than this. Another example is the objects on top of the sin boxes, on the left there seems to be a tea set and some other instruments that may represent drugs, and on the right there are two severed heads that may represent wrath or vanity. There are also folded blankets above sin boxes that do not easily connect to a major sin. These items could be cultural symbols that I am just not accustomed with to understand. The poster as it is now would likely not be effective in other cultures, because of the reliance on Chinese to understand the meaning of the elements. 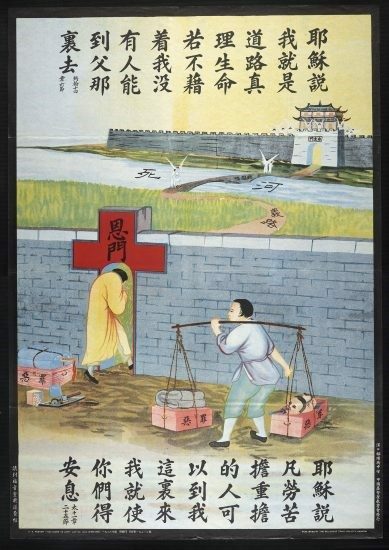 If the labels were translated then the poster would be effective in other cultures, the only remaining cultural reference would be the sin boxes and the “Gate to Eternal Life”, which is in a traditional eastern style. This poster is very similar to the first one, but much simpler. Both posters show gates in the shape of crosses with a path to heaven on the other side. This poster has less art and more labels to convey the intention. In this poster there is a thick line bisecting the poster labeled “How can you enter heaven through other ways?”. 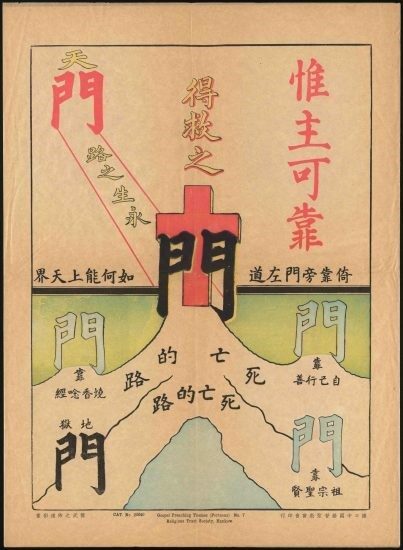 In the middle of the poster is a gate with a cross labeled “Gate of salvation” connected with this gate, on the top half of the poster, is a path labeled “Road to eternal life” which leads to another gate labeled “Gate of heaven”. Connected to the gate in the middle, on the bottom half of the poster, is a branching path labeled “The road to death”. The path leads to four more gates labeled “Relying on good works”, “Relying on scriptures citing”, “Relying on ancestors and Buddhist saints”, and “Gate to hell”. The poster has few colors but there are noticeable patters with where color is used. The “Gate of heaven”, the “Road to eternal life”, and the cross in the middle are red. Three of the four gates on the bottom are blue, with the “Gate to hell” being colored black. A pattern that may be a coincidence is that the “Gate to hell” and the “Gate of salvation” are both colored black. I think that this is just a coincidence that may have happened because of a lack of other color options. Just like the first poster this poster clearly portrays the traditional religious teachings that the only path to heaven is a righteous one. In this poster there is more detail to elaborate on what will lead to heaven, this is done by showing counter-examples of the other four gates on the bottom. Unless this poster was translated it would be ineffective in other cultures, but if it was translated then it would be effective, because of the simplicity of the poster. An element that would be lost in translation is that the gates in this poster are Chinese characters for door that also look like a gate. In this poster there are three people at a large wall, one person is on stilts trying to see over the top of the wall, one person seems to be talking to the person on stilts, and the last person is crawling through a small cross shaped hole in the bottom of the wall. The only writing on this poster are bible verses about humility as a necessity in reaching heaven. This poster is much simpler than the other two posters, there is only this picture without any labeled gates and paths. The colors used in this poster are very simple and the only connection to make would be that the person on stilts is wearing darker black clothes, while the other two people on the ground are wearing blue clothes. Even though this poster is simple it still does a good job of conveying to message of humility in religion. 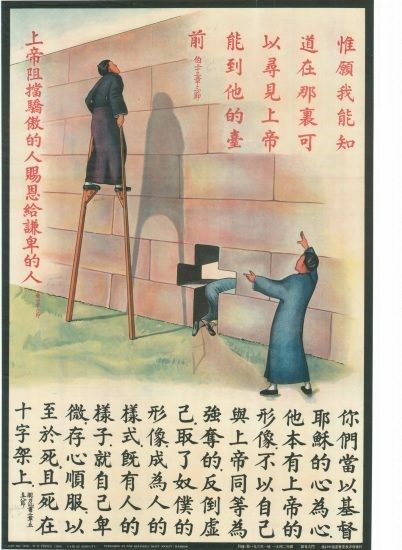 This poster has good details, including the shadow of the person on stilts shown on the wall, but the poster does not have details with confusing meanings like the first poster. Even if this poster was not translated it would be the most effective of the three posters at conveying it’s purpose. This is because of the simplicity of the poster and the situation that is depicted. I chose these three posters because of their similar messages, and the similarity between how the present the message. Each poster shows a message of how crossing through a gate to reach the path of heaven, but in each poster the gate represents something different. In the first poster the gate represents dropping and abandoning your sin, in the second poster the gate represents, a much broader idea of, what you must do to reach the path of heaven, and the third poster stresses the importance of humility in reaching the path of heaven. When in communication with each other the posters show many of the teachings of the church but may cause the question of which one is true or if all three are needed. If an illiterate person saw these posters, they would be able to get the concept for the first and third posters but would have much more trouble understanding the second poster.